Muhammad 'Ali, an Albanian military commander, succeeded in destroying the power of the Mamluks in Egypt and founded a new dynasty of Egyptian rulers in 1805. He assumed the Governorship by popular demand and forced recognition on the Sultan of Turkey, his nominal sovereign. Thereafter, Muhammad 'Ali, together with his son Ibrahim, set out to conquer the Sudan and several rebellious Ottoman provinces. The Hijaz, Syria and the Levant, even impregnable Acre, fell to their arms. They attacked Turkey proper, the Egyptian forces reaching as far north as Konya. However, the European powers, fearing a new and unwelcome foe, intervened in 1841 and forced a withdrawal from all non-Egyptian territory. Muhammad 'Ali's price and prize being unfettered control over Egypt and the Sudan, and hereditary rule by his family. 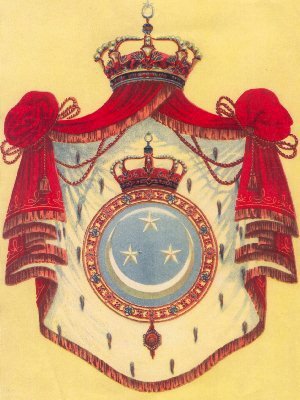 His successors assumed the title of Khedive (Viceroy) and succeeded in having this recognised by Imperial Firmans in 1866 and 1873. A debt crisis during the 1870s ended with the establishment of an unofficial protectorate under the dual control of France and Great Britain in 1879. Britain occupied the country in 1882, after defeating an abortive coup engineered by Arabi Pasha. The country officially remained a Turkish province, the Sultan represented in by a High Commissioner. On the outbreak of the Great War, the unfortunate Khedive 'Abbas Hilmi II was convalescing at his palace on the shores of the Bosphorus, after an assassination attempt by an Egyptian student at the gates of the Sublime Porte. Unable to extricate himself from his loyalty to his sovereign and unwilling to return to Egypt, he found himself deposed on 18th December 1914 and a British Protectorate proclaimed over his realm. His uncle and the eldest member of the Khedeval family, Husain Kamil, ascended the Egyptian throne as Sultan, in his stead. He died after a brief reign of three years, succeeded by his younger brother, Ahmad Fu'ad. A new Anglo-Egyptian Treaty in 1922, terminated the protectorate in favour of an independant Kingdom. However, a heavy British military presence, accompanied by a good deal of hidden control, continued for a further thirty years. Simmering discontent with the continuing British presence, at a time of withdrawal elsewhere; a failed War against Israel; large-scale government corruption; dissatisfaction amongst the majority Arabs against a predominately Ottoman ruling class; all boiled over into riots and rebellion. A military coup d'etat in 1952, forced King Faruk to abdicate in favour of his six-month old son, Ahmad Fu'ad II. Faruk went into exile in Italy, taking the young King with him, and leaving the throne in the hands of regents. The military leaders soon tired of this state of affairs and decided to abolish the monarchy altogether. They deposed the King and proclaimed a republic, within eleven months of his accession. Virtually all the assets of the Royal Family, including palaces, homes, lands, jewels, other movable and personal property were confiscated and auctioned off. The country became a one-party state, where succesful candidates for the presidency, have proved so very popular, that they have frequently attracted 99.8% of the ballots cast in elections. 'Abbas Hilmi II, Last Khedive of Egypt: Memoirs of 'Abbas Hilmi II. 1998. Almanach de Gotha: annuaire gйnйalogique, diplomatique et statistique, Justes Perthes, Gotha, 1900-1944. James Bland, Prince Ahmad of Egypt. Stanley Paul & Co. Ltd, London, 1939. Burke's Royal Families of the World, Volume II: Africa & The Middle East, Burke's Publications Ltd., London 1980. Й. Combe, Jacques Bainville & Йdouard Driault, "l'Йgypte Ottomane, l'expedition Franзaise en Йgypte et le rиgne de Mohamed-Aly (1517-1849", Prйcis de l'histoire d' Йgypte. Tome III. Institut Franзais d'Archйologie Orientale du Caire. 1933. "Decorations and Medals and the Regulations Concerning Them". Misr-el-Mahroussa: Impressions of Egypt. November 2000. The Egyptian Directory: Annuaire complet du Commerce, de l'Industrie, de l'Administration et de la Magistrature de l'Йgypte. Rizzo & Co., Cairo, 1904. The Egyptian Directory: L'Annuaire Egyptien (Egypte et Soudan). Sociйtй Orientale de Publicitй, Le Caire, 1915 and 1918. The Egyptian Directory, L'Annuaire Egyptien reuni а "l'Indicateur Egyptien" & "Egypte-Adresses". Max Fischer, Le Caire, 1927 - 1953. Indicateur Йgyptien Administratif et Commercial. Stefano G. Poffandi, Alexandrie, 1892-1896. Зelik Gьlersoy, Hidiv'ler ve Cubuklu Kasri. Tьrkiye Turing ve Otomobil Kurumu, Yayini, 1985. Hassan Hassan, In the House of Muhammad 'Ali: A Family Album 1805-1952. The American University in Cairo Press, 2000. Imad Ahmad Hilal, "Al-Raqiq fi Misr fi al-qarn al-Tasi' 'ashar. Cairo, 1999. Osman Ibrahim, Caroline & Ali Kurhan, Mйhйmet Ali le grand, mйmoires intimes d'une dynastie. Maisonneuve & Larose, Paris, 2005. Fйlix Mengin, Histoire sommaire de l'Йgypte sous le gouvernement de Mohammed-Aly ou rйcit des principaux йvйnements qui on eu lien de l'an 1823 a l'an 1838. Librairie de firman Didoit Frиres, Paris, 1839. Osman Selaheddin Osmanoglu & Ertugrul Osman, Osmanli Devleti'nin Kurulusun 700. Yilinda Osmanli Hanedani. Islam Tarih, Sanat ve Kьltьr Arastirma Vakfi (ISAR), Istanbul, 1999. Yilmaz Цztuna, Devletler ve Hвnedanlar. Volume II: Turkiye (1074-1990). Kultur Bakanligi Yayinlari: 1101, Ankara, 1989. Samir Raafat. Ancestral Tree of Prince Hussein Saiid Toussoun. Samir Rafaat. Descendants of Prince Said Omar Toussoun. Andreas Tunger-Zanetti. La communication entre Tunis et Istanbul 1860-1913, Provincet et mйtropole. L'Harmattan Inc., Montrйal, Canada, 1996.
Who's Who in Egypt and the Middle East, 16th Edition, Cairo, 1950. Caroline Williams, Islamic Monuments in Cairo. American Univ. in Cairo Press, Cairo, 2002.